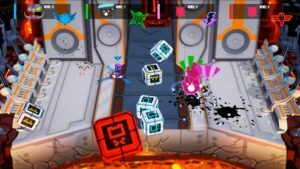 Blade Ballet is a multiplayer brawler (couch competitive or online multiplayer) where the combatants are robot gladiators who spin, slice and charge into battle to destroy their opponents and remain the last bot standing. I had the opportunity to play Blade Ballet for a couple rounds at MomoCon as part of their Indie Showcase. The game was easy to pick up – I won a couple rounds against randoms as well as someone from the development team (though they might have been polite and thrown the match) – but promises a lot of depth with multiple characters, interactive stages and special abilities which change the pace of battle. Sveri says Blade Ballet began as a prototype while vising Pax Prime. The team played a twin-sticks adventure and at one point the character picked up a melee weapon. The DreamSail crew was intrigued with the idea of just spinning a character around in circles for combat, which admittedly is not a traditional approach to battles. During a break in the conference, Sveri and the team pulled out their laptops and jammed out a quick prototype comprised of little cubes spinning in circles with sticks. “Just spinning and hitting swords was insanely fun from that point,” Sveri adds that when they returned to the office and demoed the game everyone enjoyed it. From there it was decided Blade Ballet would be the first DreamSail games completed. Larkins hopes the development team will be able to integrate a ranked system or tournament mode, especially after the engagement and fun players had with tournaments held during conventions or events. 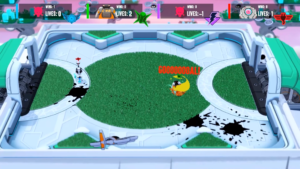 Jouard likes to hear feedback if one bot is too weak or overpowered from players during conventions, because that means they are paying attention and developing strategies for how the game should be played out. Sveri echoes that if people don’t have an opinion on the balance, there isn’t much difference to what the characters do and it isn’t engaging. Besides the bots, Blade Ballet will support 10 different levels at launch. Jouard explains there are boundary-less arenas where you can push your opponent off the edge or more objective based combat arenas. There is a soccer field, where scoring a goal makes you invincible. A ski level with exploding humans, avalanches and ski lifts dropping boulders. Another level contains a giant laser in the center that offers a substantial advantage to the player in control of the powerful weapon. Blade Ballet releases on PlayStation 4 and in the Steam Store in August. To learn more about the development process, read the Blade Ballet Blog and plan to attend MomoCon next year to preview additional titles from up and coming indie developers.